There is nothing more beautiful than the introduction of a newborn baby. 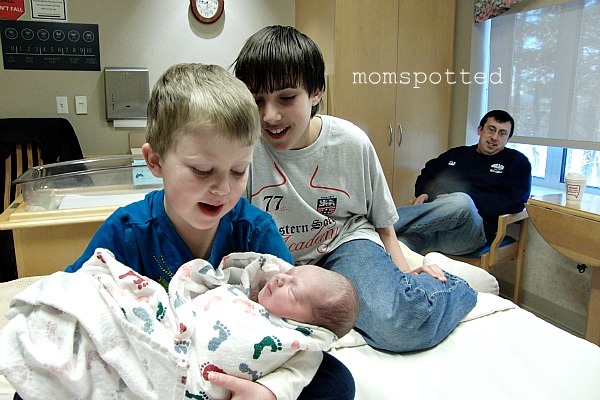 I still remember the exact moment when my husband brought my two older boys into the room and introduced them to their new little brother. It was one of many 1st milestones we were going to discover together. I’ve been so lucky to capture most of our firsts in photos or on video and I love looking back. 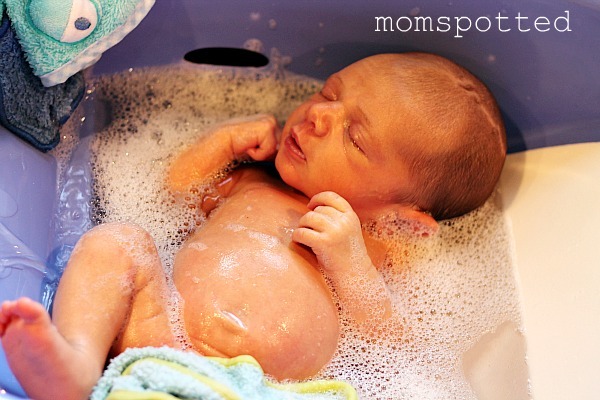 One of Sawyer’s first milestones that I love looking back on is his very first bath. I still can’t believe that he actually slept through the entire process. Our new baby’s are amazing in so many ways. Pampers Swaddlers wraps baby with superior comfort, protection and blanket-like softness, helping to take care of babies during all the precious first moments they share with their parents. They don’t forget about the little details either like an Absorb Away Liner® to pull wetness and mess away from babies’ skin. Or the Umbilical Notch to keep clear of baby’s umbilical cord area. New moms loved them so much that they asked for them in larger sizes! Of course Pampers listened to moms who said they wanted the Pampers Swaddlers softness they know and love to be available throughout their diapering years. Now Pampers Swaddlers are available through size 6! Pampers Swaddlers are Pampers softest diaper and offers up to 12 hours of overnight protection should your baby just happen to hit that amazing milestone of sleeping through the night. 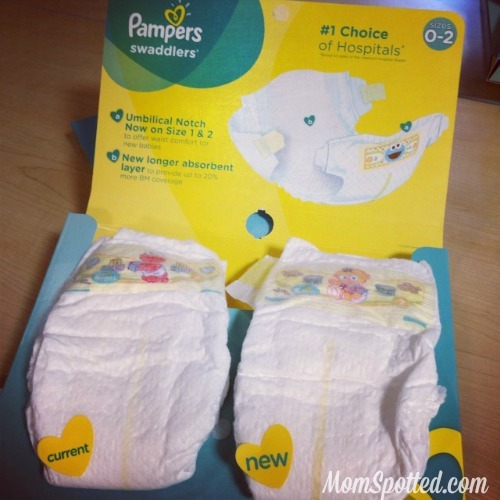 It’s really a no brainer why Pampers Swaddlers are the #1 choice of hospitals in North America! Pampers understands there is nothing more joyful or rewarding than the precious first-time moments shared by little ones and their families. In honor of this special journey, Pampers has released a compilation video entitled “Firsts” that highlight those wondrous “first” experiences together. From the first time parents see their little one on a sonogram to the first evening home from the hospital, the Pampers “Firsts” video showcases precious, heart-felt moments babies and parents share together. Pampers recognizes that all first moments, no matter how big or small, are moments to be cherished and celebrated. Pampers is honored to be a part of the journey of firsts for millions of families around the world every day. I probably should have warned you to grab some tissues first. Pampers always knows just how to touch our hearts. 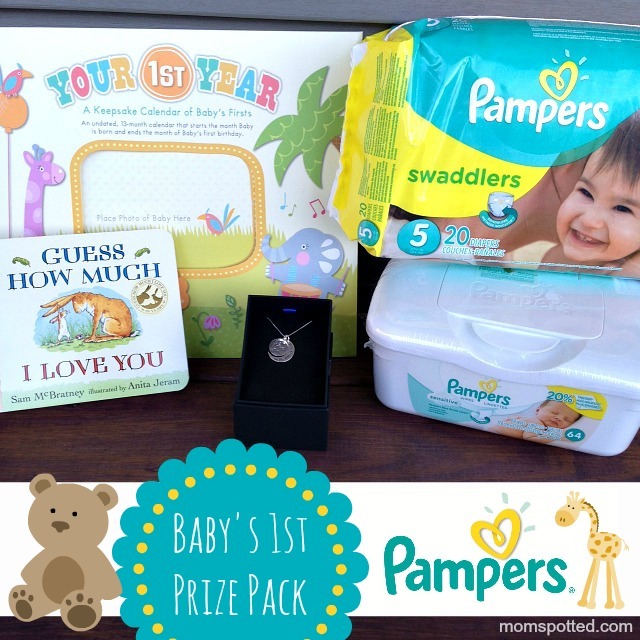 Pampers has put together several prize packs and will be giving them out to participants who attend the #PampersFirsts Twitter Party! The Twitter Party will take place on Wednesday February 11th at 9pm EST. 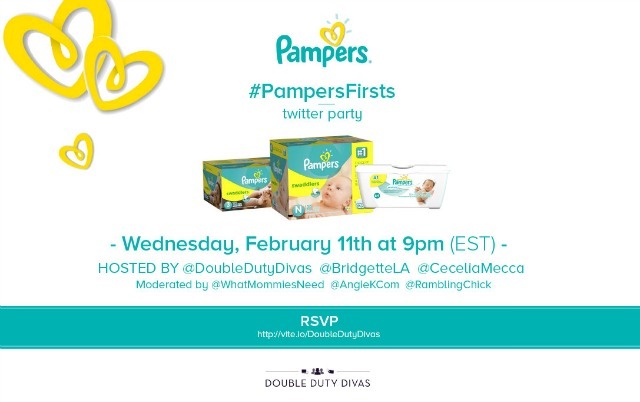 To participate, follow your hosts @DoubleDutyDivas, @BridgetteLA, @CeceliaMecca, @AngieKcom @WhatMommiesNeed @RamblingChick, and our sponsor @Pampers. Make sure to follow Pampers on Facebook & Twitter too! To enter use the Rafflecopter form below. Good Luck! Contest ends 02.23.15 at 11:59pm. For Official Giveaway Rules click here. U.S. Residents Only. Of when my son first said I love you. My favorite is first steps. My son’s first birthday. It was bittersweet for me, because his birth and first week of life had been very traumatizing and scary. I honestly dreaded his birthday. But once it arrived, i felt better. I was so happy to see how far he’d come and how much he’s changed our world. My son’s first snowfall and watching him walk around in it. I cherish the first smiles and laughs. I love the 1st giggles. Definitely the first time our son walked – I still watch the video. We were so excited! Baby’s first steps were memorable. My favorite memory was when my daughter took her first steps! We cheered her on and it was such an exciting moment! I loved my son and daughters first smile and laugh! It was so precious! My favorite is first steps! Cracking open a bottle of sparkling grape juice to celebrate the first time she slept through the night! I’m pregnant with our first baby and due this summer, I know I will have many favorite first including first breathe, first smile, first laugh, first crawl, and first steps! I recorded my daughter’s first steps, which is my favorite memory. I love the first step of my baby. My first is the first step. So amazing. My favorite was always the first steps. My sons first steps just last week! Best feeling in the world going through milestones with him! I love hearing my daughter’s first gut-laugh! Hearing my little ones first word (Mama) was a huge milestone! My favorite first is seeing them take their first steps. I always loved the first steps with my son and can’t wait until my daughter reaches that milestone. I loved the first smile! My favorite memory has to be my daughter’s first steps. She was holding a small change purse in her hands in front of her and just starting walking. Apparently, she thought the change person was supporting her! There was so many favorites for me! I have 5 kids and I would say that the most memorable one for all of them was their first smile! To me that was their first sign of sincere emotion other than crying! My favorite was her first smile. loved videotaping the first crawls and steps! Their first giggle is my favorite. My granddaughter just started laughing. It’s my favorite first right now. My favorite memory is my sons first steps. My favorite is when he first started winking. I love all the firsts, but I really love when your child looks you in the eyes and smiles big! the first time my daughter said “I love you” it melted my heart. So many “firsts” are so special and memorable…. the first time I held my babies… those first giggles are so precious… and the first time they say “I love you Mama”. Their first steps were most memorable. My favorite memories are of their first steps. Tell me one of your favorite memories celebrating one of your child’s first milestones. I love a baby’s first real laugh… an intentional great laugh from the belly! The favorite firsts we celebrated is when they began to crawl, especially up the stairs. I loved feeling my baby move in my belly for first time! I loved the first time my daughter smiled at me. I was delighted to see my babies’ first smiles. I loved my babies first laughs! One of my favorite memories was the first time my daughter said the word momma. I taught my grandson to walk one weekend when he was staying with me. He was so proud of himself. Favorite memory is my son’s first smile. My favorite was first smile. My favorite first ALWAYS is when they begin to do real belly laughs. There is nothing better than that… their sheer delight in the world. I loved hearing my son say I love you for the first time. My favoite milestone was definitely her first steps! I was so proud and we went for ice cream right after! we have 5 kids & the first steps are always my favorite! I’ve been there to see each & every one of them take their very first steps. it’s so adorable watching them toddle around on those chubby little legs! My favorite memories were hearing those first words, I love that sweet little voice! my friend,she is having a baby,twins actually,would be a great gift. My favorite memory was when my kids lost their first tooth. I think those first belly laughs are absolutely magical! Oh my favorite memory was when he first said mama…daddy was holding him! We still chuckle about it today…such precious memories! My favorite milestone was when my daughter smiled at me. I will never forget my daughter’s most recent Christmas. It was the first time she was old enough to open presents, and she LOVED it. I love the first laugh. My favorite first milestone is the first real smile. My favorite memory was her taking her first steps! On the day my oldest daughter turned 10 months old, she was VERY sick. She would sit and cry and cry. All of a sudden she wanted down in the floor, and she just took off walking across our living room! No stumbling around, no falls, just, walked like she had been doing it forever! I remember my daughter’s first trip to a pumpkin patch. She picked a pumpkin, and carried it, although it was about twice the size as she was. What an amazing prize pack. My favorite experience thus far was of course meeting her for the first time and also hearing her say “mama”, Best feeling in the whole universe! One of my favorite milestones was when he first said the word Da Da! My favorite memory is seeing the baby’s first smile. I’m a first time dad that’s anxious to meet my son in the next few months. My favorite memory is the first time he kicked and i felt it. I’m sure there will be a hundred other firsts coming soon. My favorite has to be the first time I rocked her to sleep and just watched her in my arms. Couldn’t get over how blessed I was. My favorite is when our kid’s took their first step! My favorite first of both our kids was when they took their first steps! Both were late walkers (ds at 13 months and dd at 15 months) so the were precious to me! One of my favorite milestones is when my children took their first step. mommy and daddy were big. I think the first words were the most special, and caught on tape! I remember when my twins sat up by themselves. It was a great day! My youngest walking was memorable too. I have 6 grand kids now and I’m looking forward to a lot of firsts. the first time each of my grandbabies learned how to say G’ma! My favorite memory was the first real smile and the belly laugh! I remember having a little puppy toy that flipped when you wound it up and it made him laugh so hard, it was a deep belly laugh. My best milestone (as corny as this is) is my son taking his first breath then the first time I was able to spend time with him. I lost 5 pints of blood when I had him so 18 hours later is the first time I got to actually spend with him as I was forced to go to sleep to recover enough to survive. That was my favorite moment. I don’t remember his birth as I lost short term memory with blood loss. I loved seeing my son smile for the first time. The first milestone that is my favorite is the smile. It just melts my heart! The first giggles just light me up! I also love when they start talking! My favorite memory are their first words. That MAMA and DADA along with a smile just made your heart melt. Expecting my first, so far it is feeling the kicks! My heart melted into a big pile of mush when I first heard “MAMA”. My daughter is two and a half week old….she just recently pasted her birth weight last week and is now at 6lbs 15.5oz. I love watching her sleep and make all the adorable little faces. My favorite first was hearing my husband make my son laugh for the first time, he was so proud of himself! I remember the first time he woke was a newborn and seeing his eyes. Oh gosh, it would say it was the first time I heard her laugh out loud. My favorite memory is her first steps. The first smile was always my favorite. I remember the first time my little sister laughed….so adorable and infectious! No kids, but I remember when my niece took her first steps. I always love the first real gummy smiles! It’s pure love! I like the first word. Mine will be here in June! My milestone is my son’s first word. My little girl will be 1 next month, eek! All of her milestones have been so exciting, but clapping & crawling have been my favorites. Oh, and seeing her smile for the first time & her precious baby giggles. So sweet! I like the 1st giggles. My favorite has been that first intentional smile and saying mama for the first time – melts my heart! I loved being able to capture that first step. My favorite memory is watching her take her first steps! I like my son’s first smile. The first giggle was always my favorite along with first words. Seeing our kids smile for the first time was always magical. The non-gassy smiles that is. Our littlest guy is 9 weeks old and has been giving us some real smiles for a couple weeks now and it is so cute and we just eat it right up! I love their first big smile! I remember my daughter first steps and I was the only one home when she did. The first words were one of my favorites!! My favorite first memory is when my son recognized me and gave me a big smile. I was able to capture a picture of this event and it continues to make me smile when I look at it. I’m waiting for first word. Mine would be her taking for first step… toward my phone! My sweetie pie just got her very first tooth. Finding it was fun fun fun! My favorite milestone is my son’s first word. My favorite is first giggle. i enjoyed when she started to play peek a boo. She was so adorable and called it pooke bo. I love the first smile and laugh!!! So precious 🙂 … thank goodness for cameras to keep the memories alivE! The first steps that they took were the most fun and memorable. My favorite memory is of my children’s first smiles. The first real smile 🙂 so sweet! One of my favorite memorys was when my daughter fist called me mom…still meks me smile. First birthday was a fun one! Seeing him walk for the first time. Since we so rarely have ice and snow and its ice here now I’ve thought back to my daughters first time to see snow and to play in it. I do not think she would ever say she was cold. I always love the first giggle! Her first really big laugh! Loved it! The first time that she crawled. The first time my daughter crawled, we were at my mom’s and she and i were sleeping on teh floor. She crawled over to me and jumped on me, laughing. One of my favorite memories. The first time they laugh, you just want to hear it again and again. The first time he walked on his own without any help. I loved when mine started walking! So cute!